When you’re investing in a civil construction project, the last thing you want is to have unexpected costs pop up along the way. One of the ways to prevent this from happening is to understand up front what goes in to the many process of site work and site preparation, and have estimations as to what the cost will be for each service. NOTE: This guide is by no means an exact way of predicting cost, nor should it be used as one. The only accurate way to predict the cost of site work services is to ask your civil contractor up front. Prices also vary greatly depending on the size, complexity, and location of the project. The meaning of and services included in construction site preparation and site work can vary depending on your contractor. 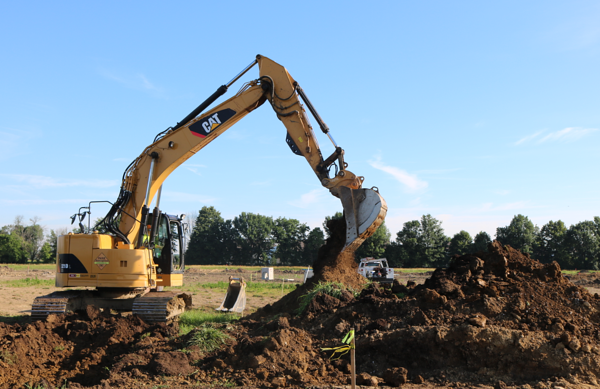 We have highlighted the ones that are most common for the majority of projects in Ohio, and ones that you are likely to encounter the next time you have site work done. So, what is included within these services? And what will they cost you? Land clearing is generally the first step in getting a site ready for construction work to kick off. It may entail cutting down trees and shrubs on the land where building is going to take place. It may also involve the demolition of old structures and removal of any other obstructive objects. Land clearing costs vary depending on the scope of the clearing to be done and its complexity, and most companies will charge anywhere between $5,000 and $11,000 per acre for the service. Site stripping is stockpiling any material that has organic matter from the construction site. Prices vary widely depending on the amount of material being moved; hauling distance, and the site conditions at the time of moving to stockpile on site. Typically, the costs for this process range between $2.00 and $5.00 per cubic yard. Grading a lot is one of the most essential tasks for a commercial site design project, and is made easier with machine control. The costs for this procedure typically range around $0.50 to $1.00 per square yard. Cut and fill refers to the process of taking (or cutting) clay from one place on a site to another. This could include moving clay from one side of the land to the other in order to make the ground more level for the future building pad, and is done using scrapers or off road dump trucks. Prices for this procedure vary depending on slope and hauling distance, but general moving and compacting costs range between $2.25 and $3.00 per cubic yard. This involves grading the pad to the finest level required for laying a concrete foundation. The costs here range from $1.00 to $1.50 per square yard, and depend mostly on the size and scope of the building pad. This includes installation of the aggregate base, for driveways, parking lots, and building pads. The aggregate base is mostly made up of crushed limestone and used as a base course. The aggregate base material varies based on location, and price is usually most dependent on the type of aggregate used. In Ohio, it is typically 304 Limestone and ranges between $50 and $60 per cubic yard to install. It is difficult, to give an accurate cost range for this because the installation costs will widely vary depending on depth, size of material, and the type of pipe being installed. You can expect to pay anywhere between $20 and $120 per lineal foot. Your commercial property will most likely need a parking lot and driveway. Similar to utility installation cost, it is difficult to give an accurate range for this service because it varies so greatly depending on the shape, size, material used, and thickness of the lot. However, the a minimum would be $2.25 per square foot. It is also important to remember that there is a cost for aggregate base as mentioned above. The average cost of parking lot striping depends on the number of markings to be made. The standard charges for parking lot paint jobs are $0.20 per linear foot. Curbs are important for demarcation in paved lots. Concrete curbs are the most common choice in many commercial entities, and their prices vary depending on shape and design. Their costs range between $10 and $15 per foot. Spreading topsoil over the green areas helps in creating a level lawn and giving more nutrition sources. Soil spreading can cost between $60.00 - $70.00 per cubic yard to import, but again it all depends on how much work input is needed, and how far the materials need to be transported. If stockpiled topsoil on site is used, you can expect to pay between $3.00 and $5.00 per yard. Construction site preparation is absolutely crucial for a strong foundation on your property. Poor preparation can put the structural integrity of your lot at risk, and you’ll spend even more than you thought in the end. One of the only ways to make sure that your site work costs do not get out of hand, is by choosing an experienced and trustworthy site work contractor.